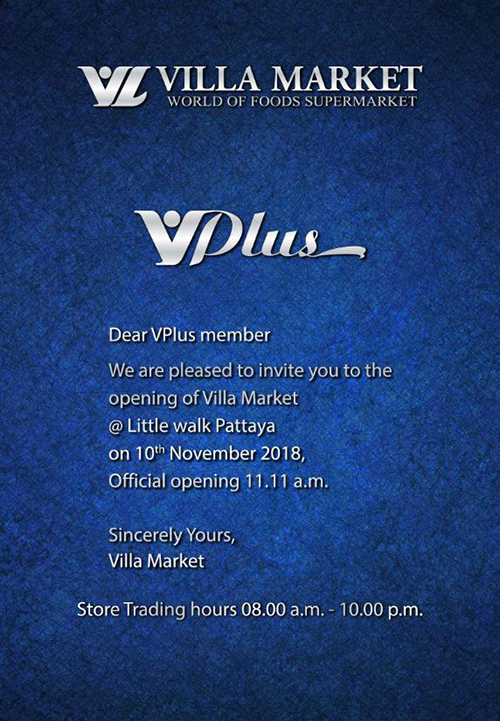 Villa Market - World of foods supermarket - will open a new store in Pattaya on Saturday 10th November 2018. 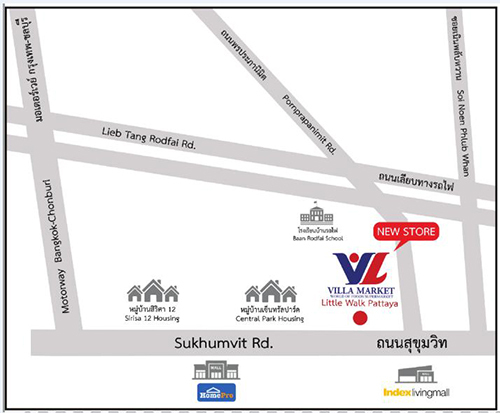 The new store will be located on Little Walk Pattaya Sukhumvit Road. For anyone wanting to find it easily it is located in a new strip mall where the original Index store was almost directly across from the latest index store. There are many more shops in Little Walk besides Villa Market. A Watson's is soon to open. A Starbuck's and KFC are already open. Several shops appear to be vacant and not yet leased. Villa Market appears to be at least as large, perhaps larger, than the one in The Avenue. Getting there may be a bit awkward because Little Walk is located on the southbound lane of Sukhumvit, meaning where most of those of you located in Pattaya will be trying to get there from the northbound lane. 1. From the northbound lane you will have to go past the Rt. 7 entrance and then make a U-turn from Sukhumvit and backtrack. 2. Take the railroad bypass road northbound and turn left onto Rt. 7. That will take you to Sukhumvit, where you turn left and backtrack. I went this morning for their grand opening and I was duly impressed. The store is larger than the one in The Avenue and has many more items available, some high priced and some competitively priced - and a great many hard to find items. Many price reductions for the grand opening too. Many Villa Market executives were there to make sure everything ran smoothly - and everything did, but I was somewhat surprised that the owner wasn't there. I've met him a couple times before, but I did not see him there today. For the grand opening there were all kinds of freebies, samples, and discounts. Just walking into the store there were loads of samples and freebies, plus many more once inside. You can literally eat your way through the store. This, of course, was for their grand opening. I have no idea whether that will last beyond today, but whether it does or not, it's worth the effort to get there and check it out. Sorry RichLB. I looked for Fritos for you, but didn't see any. And no corned beef hash for me. Oh well, can't have everything, but plenty of items from Europe, USA, Japan, and Korea. Just as I was walking out, lvdkeyes was walking in. If he posts, I'll be interested to see what he thinks of it. I will certainly be doing my grocery shopping there often, but Villa Market is usually more expensive than most other grocery stores, so I will probably continue making other grocery stores my first stop and head for Villa Market if I can't find what I'm looking for elsewhere. One other thing I liked. They had the usual parking lot attendants, but they were hand signaling and NOT blowing whistles. I appreciated that. I agree. I like a good steak, but I'm not about to pay 2000 or 3000 baht for it, especially if I have to cook it at home myself. I've lived all my life without Wagyu and Kobe beef, and for these very high prices my thinking is what the hell do I need with it now? And please, folks, I don't need a lecture about how much better that beef might be. I'm sure it is, but I'm not willing to pay the price for it. As for the bakery department, I also like Big-C Extra much better, along with several other places. In my opinion Villa Market is at its best when it comes to hard to find items, imported items, and premium quality produce. I once sent Villa Market an email regarding an American brand of sausages that had disappeared from their store at The Avenue. They responded within a day with an interesting explanation of their difficulties in sourcing that brand and said they were still hoping to work something out. Two weeks later a good selection of that product re-appeared in the store. Gaybutton wrote: Sorry RichLB. I looked for Fritos for you, but didn't see any. Fritos are on the very top shelf. No durian (darn) or russet potatoes. Agreed, a welcomed, very impressive addition to the food scene. Typical Villa pricing, big wine selection. Everyone very friendly, unlike the Avenue. No parking lot attendants like Foodland with umbrella service if it's raining. Up2u wrote: Fritos are on the very top shelf. Thank you. I missed them somehow. I'll try to find them next time.